From Design to Completion - your Tacori has been touched by more than forty (40) artisans! Tacori is known for elevating craftsmanship to an art; our signature platinum / 18 Karat and diamond rings fuse old world elegance with modern glamour and style. Each Tacori ring is hand-crafted by their expert artisans to fit the individual needs of every customer. This debonair men's band is a symbol of both love and impeccable taste: nine princess-cut diamonds align just off-center with milligrain accents along the band. Hand-engraved details subtly accent just the interior ridges. "Metal" choice can be selected in the drop down box in "ADD TO CART" Finish may also be selected in the drop down box in "ADD TO CART". Accent diamonds may be deleted in drop down box in "ADD TO CART"
design. Prices listed reflect US dollars. 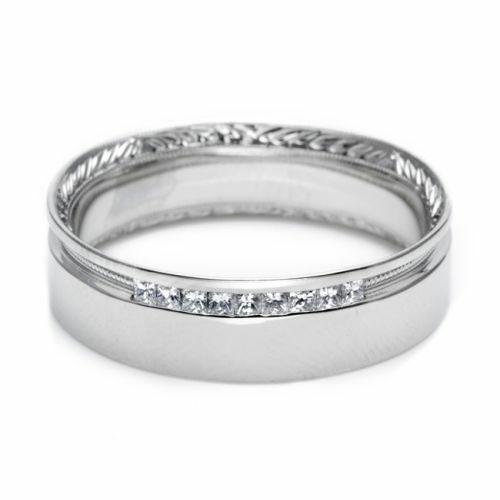 Each Tacori ring can have many individual options; metal (18K or Platinum) , accent diamonds, engraving! Questions? Need a modification? - call TQ Diamonds' expert staff at 608-833-4500. 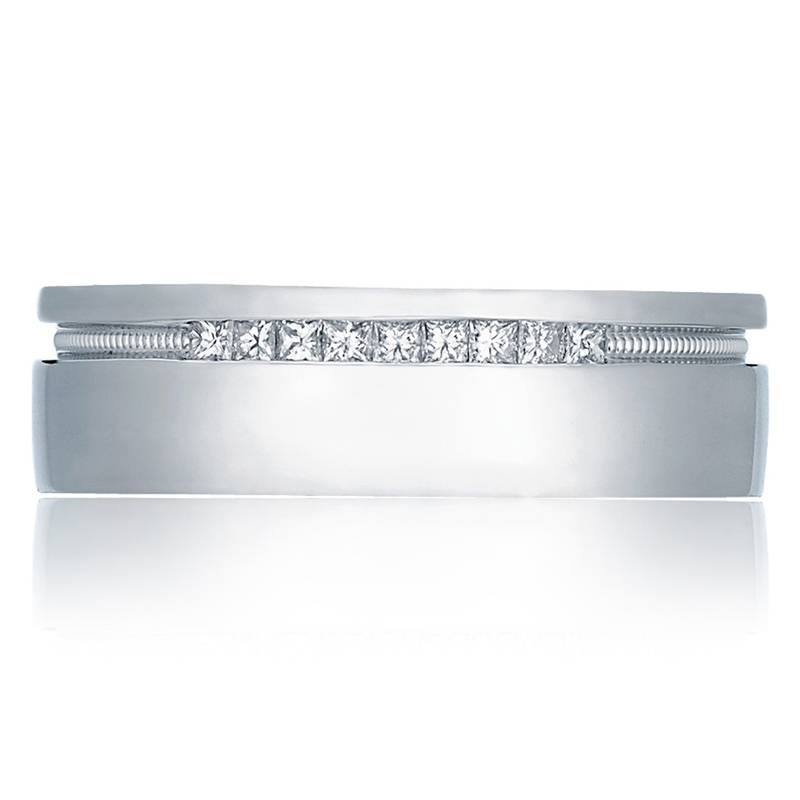 We can create a custom Tacori ring that will fit your budget! 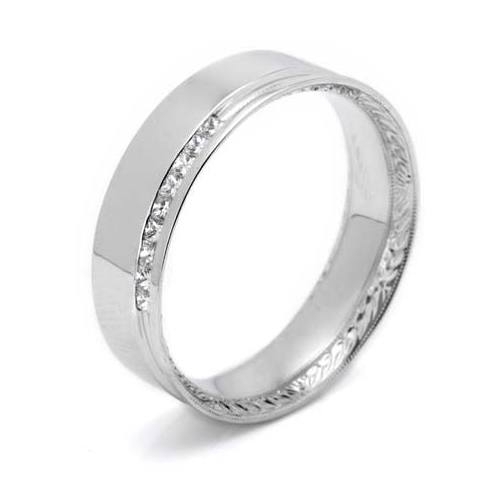 Highly Polished Finish, Satin Finish (S), Pebble Finish (PB) - select your finish at "ADD TO CART"
SAME DAY - FREE SHIPPING always at TQ Diamonds.com! Tacori rings in stock, ship within 24 hours. 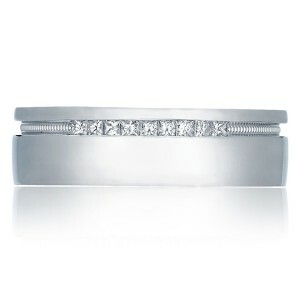 Since Tacori rings are custom made to your finger size, it may be necessary for us to place a custom order with Tacori. 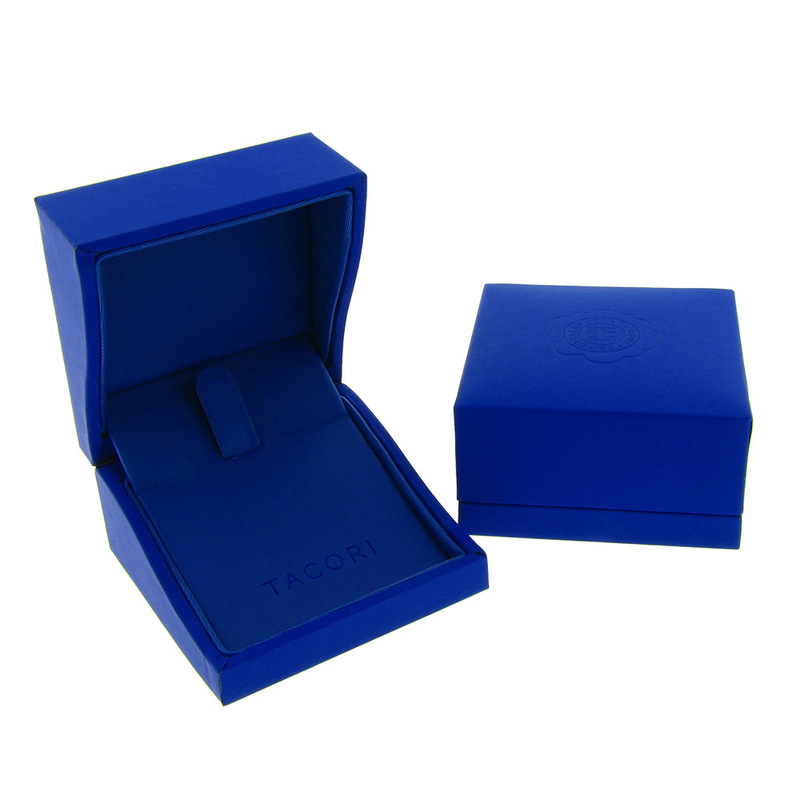 As an authorized Tacori retailer, our orders are usually filled first. Please allow 3-4 weeks for delivery. We will contact you, if it needs to be ordered. 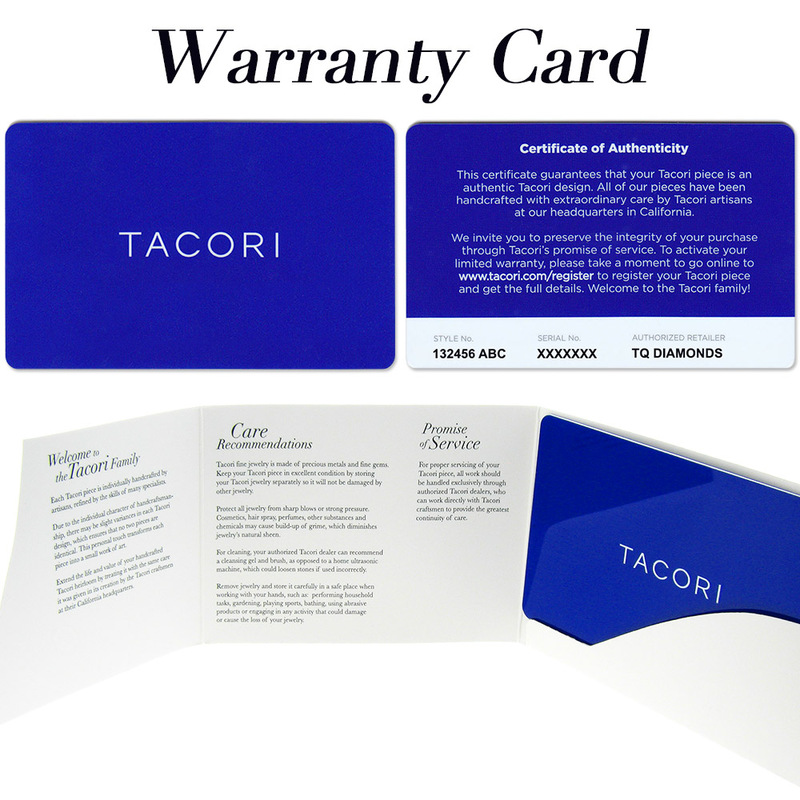 What does the Tacori Warranty Cover? Click here to review TQ Diamonds comprehensive protection plan! Can I buy directly from Tacori? Tacori does not sell directly to the public. Tacori is a designer and manufacturer of rings, fine jewelry and accessories. 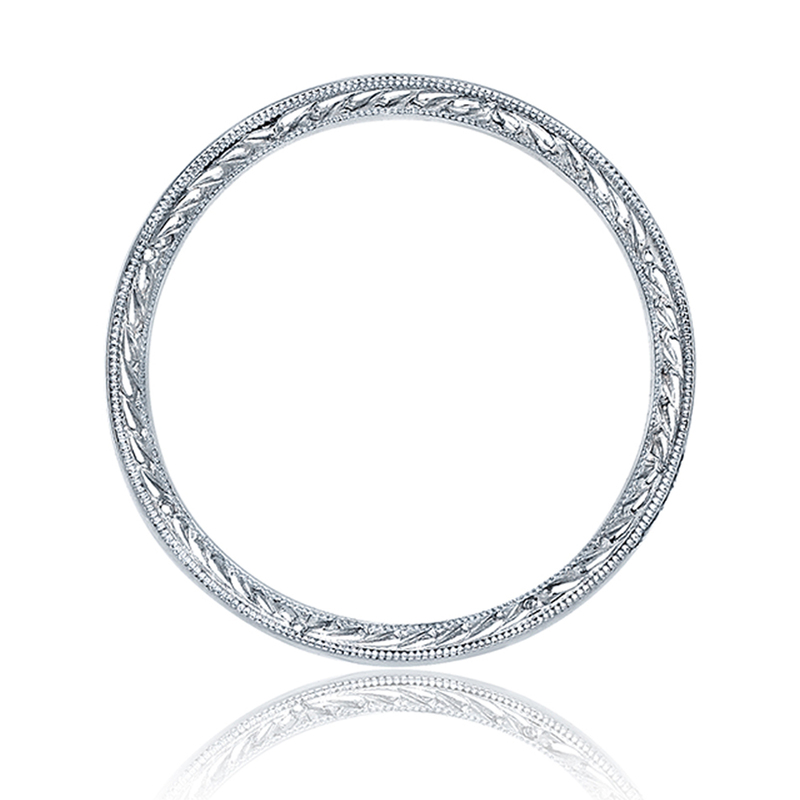 All of our jewelry is distributed to the public exclusively through Authorized Tacori Retailers. TQ Diamonds is a premier authorized retailer, who is more than happy to assist you with sales, pricing and service. What is an Authorized Tacori Retailer? TQ Diamonds, as an Authorized Tacori Retailer, is a reputable and well-established jewelry store that carries the Tacori collections! TQ Diamonds has exclusive rights to represent and sell our jewelry. Tacori has personally chosen TQ Diamonds because they have the experience and expertise to properly represent Tacori and provide you with the best service available. TQ Diamonds is an American Gem Society (AGS) Member - since 1998. The American Gem Society (AGS) helps take the guesswork out of finding a qualified jeweler. TQ Diamonds is considered one of the top jewelers in the U.S. and Canada, as a member of the American Gem Society. AGS jeweler, TQ Diamonds has completed comprehensive certification exams to earn their credentials and must keep current on industry trends in order to maintain these strict credentials. The American Gem Society guarantees that TQ Diamonds is ethical, trustworthy, and of course, knowledgeable in diamonds and gemstones. Don't risk losing your Tacori warranty! This warranty is void if your Tacori was purchased from an online auction site or has been damaged by unauthorized service, negligence or accident, or other causes not relating to defective material or workmanship. Don't risk losing your warranty buying a Tacori from an online auction site that can't offer a valid warranty! TQ Diamonds is your #1 authorized dealer.